Located in Fullerton (Orange County) CA, MASON MACHINE & TOOL has been helping manufacturing companies improve quality and productivity by producing precision jigs and fixtures and tooling. Whether producing an inspection fixture that uses simple toggle clamps or an automated assembly device that has numerous pneumatic components, we have the experience to deliver tooling that will increase your profitability. 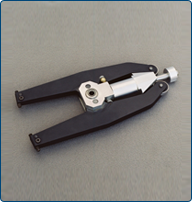 MASON MACHINE & TOOL builds fully assembled jigs and fixtures and tooling from start to finish. We take care of any required outside processing such as heat treating or plating. If your company has an in-house machine shop or tool room, MASON MACHINE & TOOL can help with your overflow work. We can help solve your problems with “headache” projects that you don’t want any part of. If we see a way to improve something, we are happy to offer suggestions that can assist you in creating less expensive or more effective jigs and fixtures and tooling. When MASON MACHINE & TOOL is awarded a purchase order to build fixtures or tooling for our customers, we become a member of their team. We are committed to building tools that will help them make their products faster and better. The next time you have a need for tooling, call or email us for a quote. We’d like to become a member of your team.